Everything we know about animated films has been a lie. Years of hands-on education has perpetuated the illusion of simple childhood fantasies, where plucky characters become caught up in whimsical adventures full of color, laughs and catchy music. Their greatest architect, Walt Disney, powered that device so relentlessly that it has fueled nearly all his successors – including the Pixar brand, whose recent “Coco” brilliantly mimics that tradition. 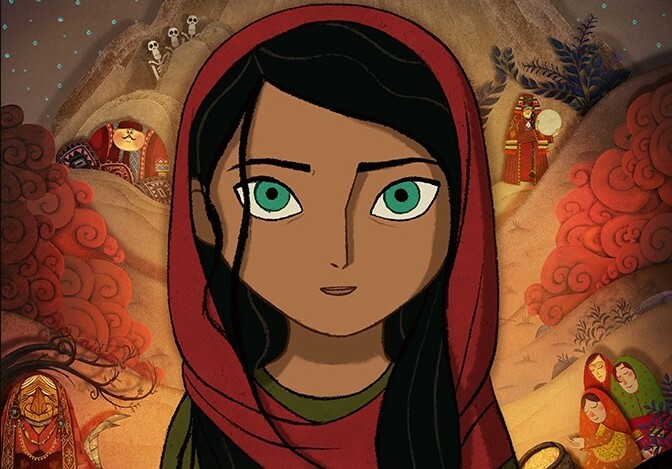 But now comes “The Breadwinner,” the closest a cartoon has ever come to removing the barrier separating childhood wonder from the deafening tragedies of the real world, and what its creators find is a power in conviction that challenges all we know about the medium’s elasticity. More akin to “Pan’s Labyrinth” than a mere yarn about goals or quests, the movie throbs with a confidence that is as alarming as it is heart-wrenching. Rarely are such stories aimed at the politically aware, and even more tenuous is the candid insinuation that storytelling can be the key to facing down the nightmares of a world designed to destroy our agile hearts. Those would not have been decisive declarations had the material involved a protagonist less than deserving of them. That young heroine is Parvana, a confident young girl with curious eyes whose life involves a slow dangerous slog through the social chains of Taliban-infested Afghanistan. In the early scenes she is seen quiet and withdrawn, yet fiercely protective of her father; a kindly older man with a missing leg, he has taken to the streets to sell precious belongings to feed his family, and he is thankful when passers-by pay him no heed rather than the more violent alternative. Alas, a chance encounter with an arrogant teenager propels an unfortunate destiny that lands him in jail, leaving Parvana’s family without a male figure to guard over them. The political ramifications of that scenario are reflected in a subsequent scene when the family’s mother wanders off to the prison to seek an audience with her captive husband, and she is chastised then beaten by a prison guard for being outdoors without a male figure. Provisions become scarce. Parvana risks her own safety merely by stepping outdoors to retrieve a pail of water from a nearby well. Merchants in the public market refuse to sell her food, because to do so would amount to sweeping punishment. Then the movie uses a story device inspired by “Mulan,” where the young girl cuts off her hair and pretends to be a boy so she can provide for the starving household. The undercurrent of her journey is not so much about going unnoticed in the masquerade, however, as it is about finding the enthusiasm to keep up such an elaborate illusion – something that becomes mostly possible based on the inspiration she acquires from a story she relays to her infant brother throughout the picture, involving a young hero who is trying to save the town’s crops from an evil Iron Elephant at the top of a dark mountain. “The Breadwinner” cuts between these two contrasting fables for a dual purpose: 1) to show us the avid dreamer behind the plain and nervous façade of this young girl; and 2) to mirror her experience and, perhaps, console the severity of it with the fantastical (almost absurd) danger of the other. That was one of the primary functions driving “The Secret of Kells” and, to a lesser extent “Song of the Sea,” both of which were produced by the same animators. What all three films suggest, at least among perceptive followers, is a stirring connective tissue between the stories of young minds and the dangers they face in open reality, where fantasy is replaced by a maw of violence and persecution (“Kells,” by comparison, told the story of a boy whose daydreams provided escape and then resistance from the dangers beyond the walls of his order’s compound). Do young storytellers invent those sorts of challenges as a way of dealing with real ones they have yet to confront? To endure when the shadow looms, does relying on the hopes in elaborate fictions give you a greater sense of confidence? Twomey and her very talented artists are used to establishing a conflict with elaborate stakes, but here they are working with a story that transcends basic moral tiers and penetrates to a relevant modern subtext. Think about how fresh the memories are of the Middle East conflicts, not to mention the alarming reveals about abuse towards women emerging in Hollywood. Here is a movie that is not only profoundly moving, but timely. Parvana and her family are not mere creations for a cartoon's canvas. They exist in the very real man-made prison of gender identity. Deep understandings enrich their relationships. Dangerous risks are not a choice but a necessity. At first the girl is conflicted by the eccentric nature of her masquerade, but then discovers a terrible common bond – namely, another girl also pretending to be a boy, doing odd jobs around town in exchange for money. A friendship emerges that becomes pivotal as the story moves further into murkier territory, of course, because desperation is a profound link between the oppressed. And when the money they bring in may, potentially, prove to be an asset in bribing a prison guard to connect Parvana up with her father, she is given a broader outlook than mere survival. But will any of that be possible, she fears, when news reaches her that her terrified mother has written to a relative and arranged a marriage between his son and her daughter, hopefully allowing them safe passage out of town before American bombs start going off? So much of “The Breadwinner” is wall-to-wall with downtrodden developments that it’s a wonder the screenplay offers its heroine time to tell her more lighthearted fairy tale on the side. Yet she does, we begin to suspect, because there is something important hidden within the plot – perhaps something that is not only motivating, but in a way painfully perceptive about a detail that goes undiscussed in the foreground. The film’s climax happens not at the prison, where most suspect it ought to, but rather on the mountain in Parvana’s story, where her hero confronts the elephant and says something so literally devastating that it moved me to tears. But its through that emotion, the movie argues, where fears are quelled long enough to take the necessary risks. Will young Parvana unite her family, even though their destiny may take them out of town just as it seems possible she may save her father from his prison cell? The final twenty minutes are an ambitious overlap of dramatic tension and focused tonal intensity that seem to complicate all the obligatory values of the animated medium, where the characters are usually tasked with achieving a goal that has some level of finality to it (not to mention a payoff). To see those principles violated is to wonder whether any of it belongs in a cartoon. Contemplate that possibility and then ask yourself an even more probing question: would you have cared as much about a young Islamic storyteller if you were seeing her in the flesh, or does a drawing displace that acknowledgment and bring you closer to the heart of the issue?